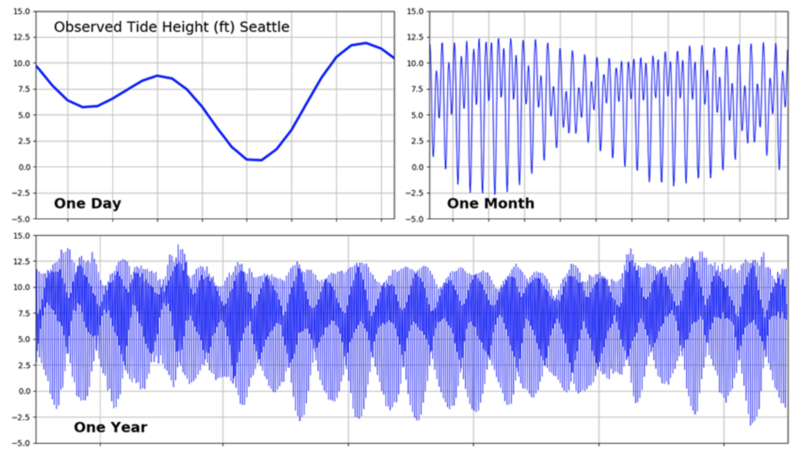 Tides in the Sound are large, with ranges between 3 and 4 m. The tides are forced by the tidal variation of sea level at the mouth of the Salish Sea – the seaward end of the Strait of Juan de Fuca. However, the tidal range actually increases as you move landward, and the biggest tidal range is at the extreme southward end. In addition, high tide occurs about 1 to 2 hours later in Olympia than it does at Admiralty Inlet. The tides bring in about 8 km3 of water each high tide, removing it roughly 12.4 hours later. The tides are what cause the strongest currents in the Sound, peaking around 2.2 m s-1 in Admiralty Inlet, 3.4 m s-1 in Tacoma Narrows and over 3.8 m s-1 in Deception Pass. While tidal currents are quite apparent to boaters, their importance to Puget Sound water quality is primarily because of the turbulent mixing they cause. In terms of the residence time of water in the Sound, the important currents are the persistent ones. Tidal currents mainly move water back and forth, over a distance called the tidal excursion. The tidal excursion in Admiralty Inlet is about 20 km, and in Main Basin it is about 1.5 km. However, if you put a current meter at any place in the Sound (or any other estuary) you will find that after averaging over many tidal periods the mean is not zero, but instead there is a persistent inflow of deep water and outflow of shallower water. This pattern is called the “estuarine circulation” or the “exchange flow” and it is a characteristic of every estuary in the world. In Puget Sound the estuarine circulation turns out to be very large, and exerts a profound influence on water properties. Parker MacCready is a professor at the University of Washington School of Oceanography and a member of the Encyclopedia of Puget Sound editorial board.